This is a great out and back along the Halifax waterfront. Fantastic views of the harbour, passing by several important Halifax landmarks. There is a dedicated path/boardwalk for most of the route. We start at the foot of the McDonald Bridge (which crosses over to Dartmouth), passing by Casino Nova Scotia on Upper Water St. The boardwalk begins at the ~1 mile mark at the Ferry Terminal. This area is busy in summer, with several great seafood restaurants, shops, and merchants. Run by the Maritime Museum of the Atlantic, and then out along the boardwalk path jutting out the harbour. 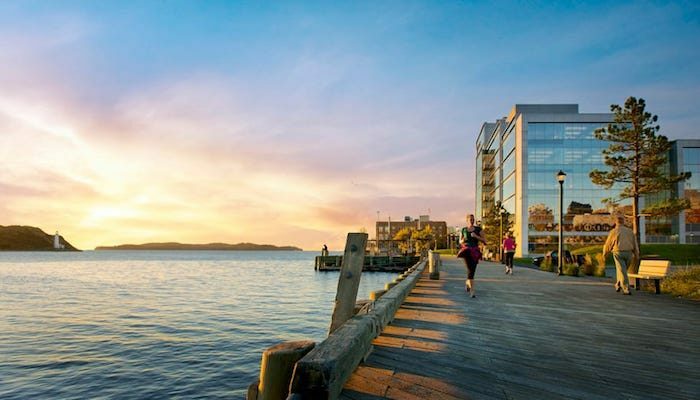 At the ~2 mile mark, there’s a cluster of popular spots: Atlantic Film Festival Outdoor Experience, Seaport Farmers Market, Garrison Brewing Company, and the Westin Nova Scotian hotel. Turn around when you reach the Canadian Museum of Immigration, at Pier 21. Options for the return: retrace your steps. For variety, best streets heading north to the start are Lower Water to Upper Water. For shops, use Barrington St., and for residential, take South St. to South Park St.
Longer run: From Pier 21, extend nearly 1 mile along Marginal Rd., to Point Pleasant Park, and do eve more! Shorter run: Start at the Casino, which saves ~1 mile in each direction and is almost all boardwalk.